In a recent PCGamesInsider.biz interview with Square Enix Montreal's studio head Patrick Naud, it was revealed that the studio is no longer working on the GO franchise. In my mind this news does not point towards a positive direction for the company, at least when it comes to their mobile titles. Obviously games with an upfront price do not earn nearly as much on Android as the many free-to-play titles out there, but does that mean premium games aren't worth the trouble? Well, it would seem so, at least for Square Enix Montreal. Square Enix's Deus Ex: The Fall was a major entry in the Deus Ex franchise tailored for touchscreen devices. It may not have the complexity of its console brethren, but it made a very valiant effort. Now the company has announced Hitman Go, but this time, the mobile version of the game is going to be quite a bit different from the AAA one being developed for televisions. 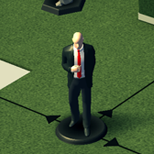 You see, Hitman Go is going to be a turn-based strategy game. No, I'm not judging. I'm just surprised. Don't get me wrong, there's potential here. Stealth-based games have an inherent element of strategy in them.